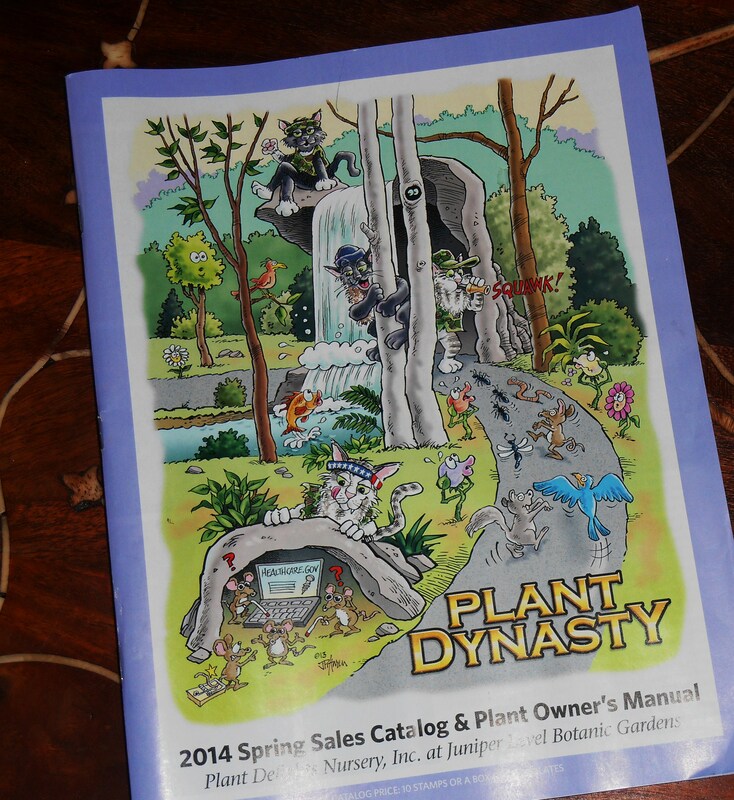 When the 2014 Plant Delights Nursery catalog turned up in my mailbox this weekend, I was thoroughly Delighted! So far I’ve managed to make it all the way once through to hit the highlights, but I’ll be returning to this beautiful book again and again over the next few weeks. 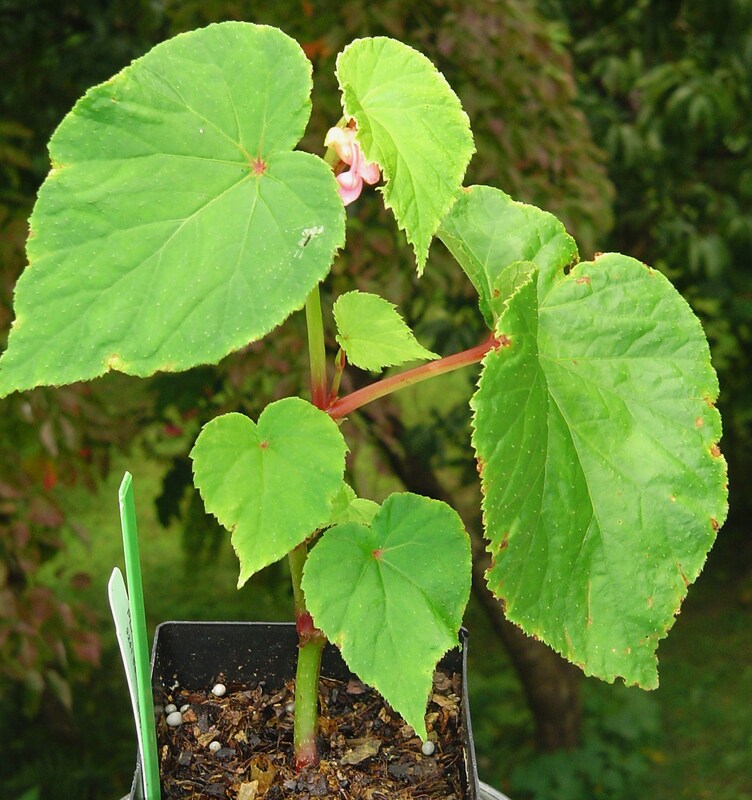 Begonia grandis, “Heron’s Pirouette” as it arrived from Plant Delights in late summer. Finally! Kindred spirits who understand the intricacies of a gardening addiction! Plant Delights Nursery, near Raleigh NC, shares the same 7b climate zone we enjoy here in Williamsburg. These expert gardeners know how to work with the opportunities and limitations of this climate, and most importantly, how to stretch those limits with careful placement of marginal plants. They offer a dizzying array of beautiful perennials collected from around the planet. 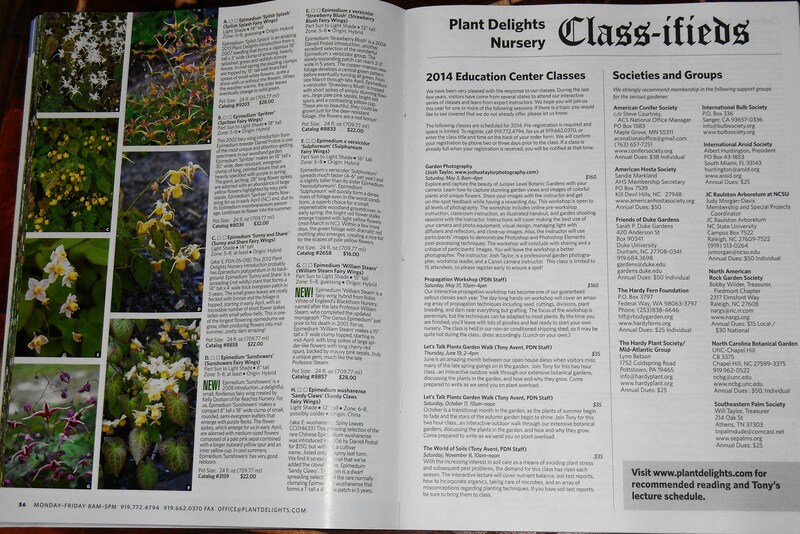 You will find plants offered in this catalog that you’ll never find anywhere else. You will also find plants offered here which finally make it to the more mainstream plant vendors several years down the line. 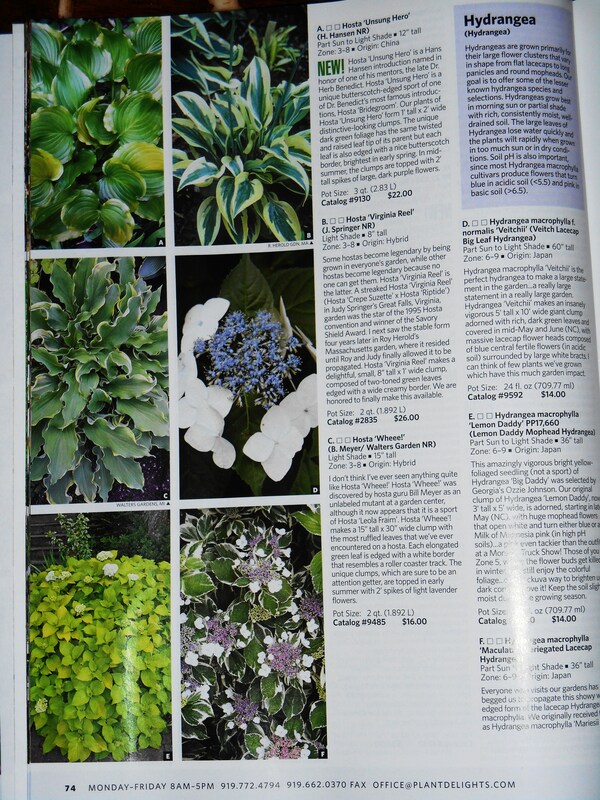 This is absolutely the most informative plant catalog I’ve ever read. It is as much text book or gardener’s hand book as it is catalog. It also lists a variety of tours, workshops, and classes offered at their Juniper Level Botanic Gardens, and a list of plant societies readers are encouraged to join. 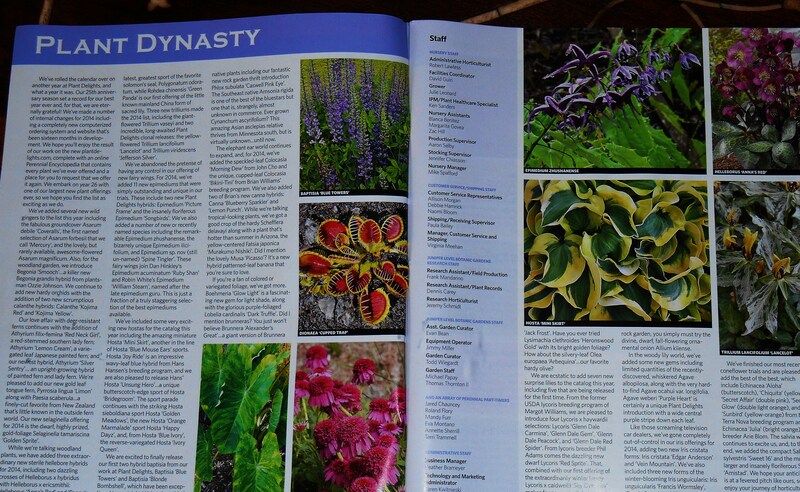 If you are an enthusiast of particular genera, as am I, this catalog holds particular fascination. This nursery specializes in several specific genus groupings of plants, such as Hosta, and offers many new introductions and unusual cultivars. Epimedium, or Fairy Wings, hold a special place of honor in the 2014 offerings. Nearly 30 different cultivars appear in the catalog. This ephemeral, but hardy, woodland plant appeared as a surprise in my garden several years ago. It came along with a gift of Hellebores from a friend’s garden. Its beautiful leaves appeared the following spring, followed by delicate, graceful flowers. It spread from her garden to ours that easily. Now I’m trying to decide which cultivar offered by Plant Delights to order this spring. I plan to grow some in a low pot with fern, close to the house, where I can really appreciate them. What a difficult choice! Plant Delights ships their plants already growing in pots. Plants arrive healthy and ready to take off. I’ve had excellent experience with the staff over several orders now. The nursery is run by kind, intelligent, horticulturalists, who love these plants and take a personal interest in their well-being; before and after sending them out into the world to grow in someone else’s garden. 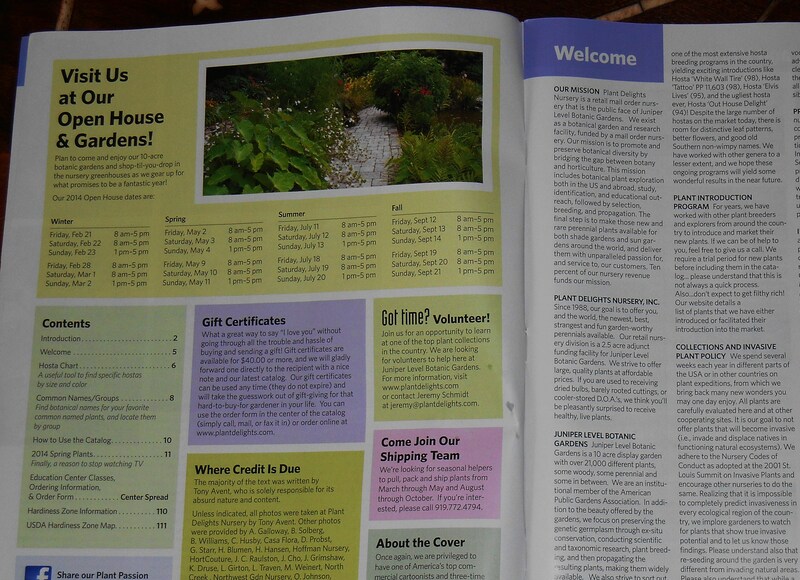 If you’ve never had the fun of reading a Plant Delights catalog, please log onto their website, and take a look around. You may be as astonished as I at the wealth of information offered on a huge array of gardening topics. Even the most experienced gardener will find information to amuse, entertain, inform, and of course, Delight! 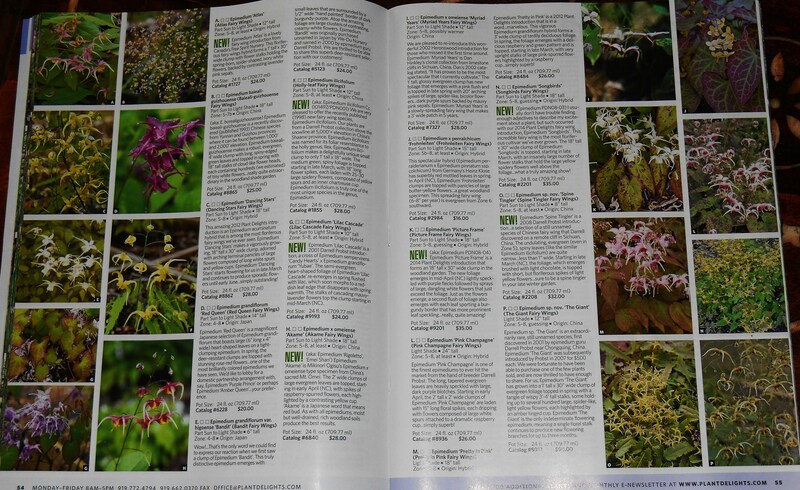 I love to browse plant catalogs too.